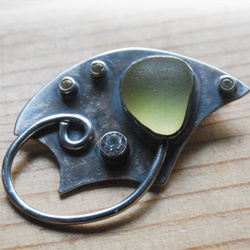 This sterling silver sea glass brooch features a light green colored piece of vaseline sea glass found in Northern California. 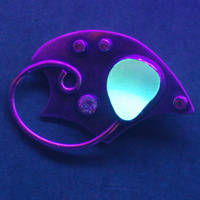 The sea glass glows neon green under a black light. Because of the site where the sea glass was found, we estimate this piece to be from approximately WWII era. The brooch is accented with one faceted cubic zirconia and three faceted sapphires. The front has a lightly textured finish that has been given an antique patina. 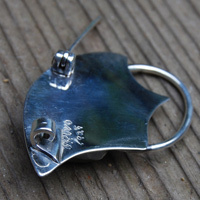 There is a cuved grip on the back to keep the pin in place. 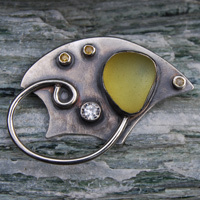 It measures The brooch measures 1.75x1.25x.5 inches.